Background Genetic factors alter the risk for nonalcoholic fatty liver disease (NAFLD). We sought to identify NAFLD-associated genes and elucidate gene networks and pathways involved in the pathogenesis of NAFLD. Methods Quantitative global hepatic gene expression analysis was performed on 53 morbidly obese Caucasian subjects undergoing bariatric surgery (27 with NAFLD and 26 controls). After standardization of data, gene expression profiles were compared between patients with NAFLD and controls. The set of genes that significantly correlated with NAFLD was further analyzed by hierarchical clustering and ingenuity pathways analyses. Results There were 25,643 quantitative transcripts, of which 108 were significantly associated with NAFLD (p < 0.001). Canonical pathway analysis in the NAFLD-associated gene clusters showed that the hepatic fibrosis signaling was the most significant pathway in the up-regulated NAFLD gene cluster containing three (COL1A1, IL10, IGFBP3) significantly altered genes, whereas the endoplasmic reticulum stress and protein ubiquitination pathways were the most significant pathways in the down-regulated NAFLD gene cluster, with the first pathway containing one (HSPA5) and the second containing two (HSPA5, USP25) significantly altered genes. The four primary gene networks associated with NAFLD were involved in cell death, immunological disease, cellular movement, and lipid metabolism with several significantly altered "hub" genes in these networks. 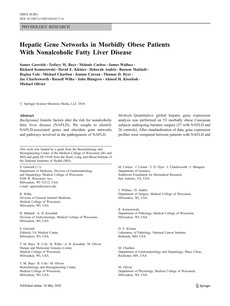 Conclusions This study reveals the canonical pathways and gene networks associated with NAFLD in morbidly obese Caucasians. The application of gene network analysis highlights the transcriptional relationships among NAFLD-associated genes and allows identification of hub genes that may represent high-priority candidates for NAFLD.